With cactus’ sticking around in interior trends – we love this sale bargain at H&M. This cute antiqued tone metal candle stick is the perfect little metallic home accessory to add to a room. Use a few on a mantelpiece, table centre or with other pieces clustered on a coffee table. Pop this date in your diary for July and get yourself a ticket for the Art + Antiques for Everyone event at Birmingham NEC. Art & Antiques for Everyone is the largest and most established vetted art, interiors and antiques fair outside of London. Bringing together more than 200 specialist art and antiques dealers at the NEC in Birmingham. Buy with confidence from an inspiring array of eclectic categories of beautiful, unusual and rare objects from antiquity to the present day. Discover a diversity of periods and styles crossing a variety of disciplines including ceramics, glass, paintings, jewellery and British and continental furniture to 20th century design, art deco items, silver, decorative collectables and contemporary pieces. Back again for its Spring show is Midcentury Modern at Dulwich College, South London. Find yourself amongst vintage furniture, lighting, and accessories from Scandinavia, America and the UK. Design classics and hidden gems are up for grabs, so make a date and head down to East Dulwich for this one day event. With over 50 dealers all in one space, you are sure to find a little something to take home. With it’s ever changing collection, Rockett St George always has gorgeous lighting, including this antique brass cylinder pendant light. The long narrow shape creates subtle drama, with the brass finish adding a lux feel. Available in two sizes [ £120 & £150 ] they look great as an individual light or grouped together at different lengths. Letter accessories are a great way to personalise your home with new and old type styles, available online, in stores and from markets. It’s a unique alternative to home accessories – looking good wall mounted, hanging on doors or standing on sideboards or shelving. We love these ‘individual black letters and numbers screened onto clear perspex with geometric detailing‘ sourced by Respect Your Elders and sold through Pedlars World (online) – £12 each. 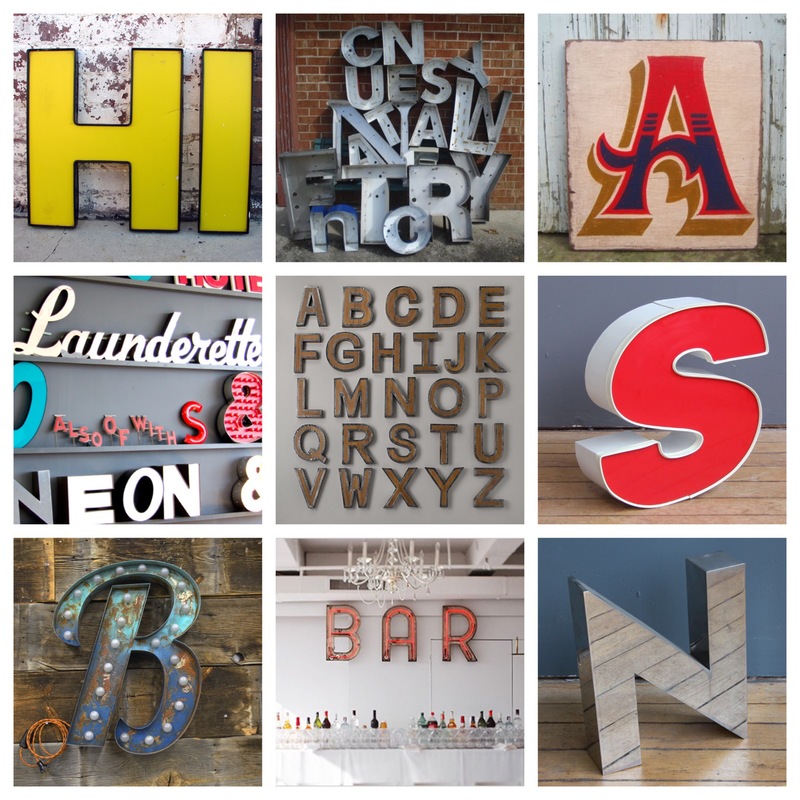 Explore vintage shops and antiques fairs to find discarded vintage fonts previously used for signage in pubs, shops, and other businesses. Ebay is also a great source for these. Spell out motivational words, names or statements or just choose single initials.